Easy Asparagus Recipe ready in 30 minutes, a one-pan stovetop dish. 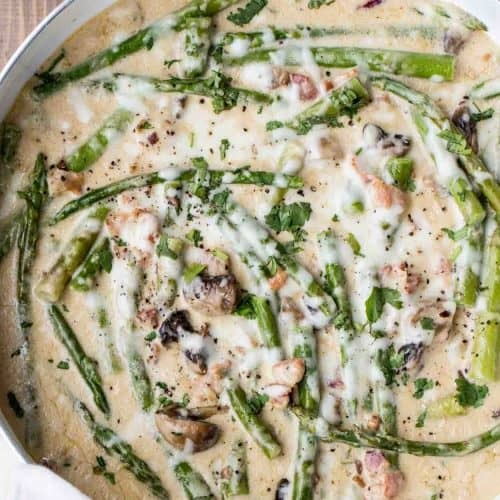 Tender asparagus smothered in the most delicious cheesy parmesan alfredo sauce loaded with bacon and mushrooms. This creamy asparagus is the perfect side to Bang Bang Shrimp or Chicken Parmesan. Though asparagus is great with salmon, it’s a side you can add to just about any meal. If you don’t have a love relationship with asparagus, you will after this recipe! 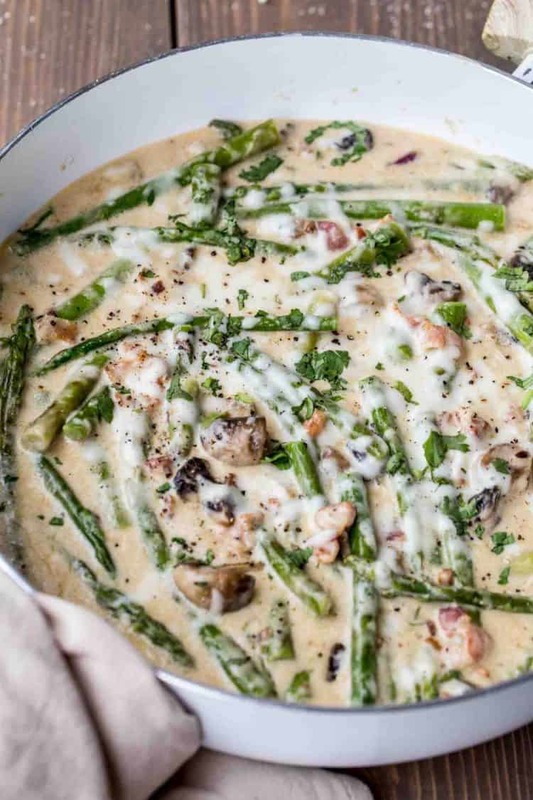 The asparagus is so tender from blanching and once cooked in the creamy Alfredo sauce with bacon and mushroom and topped with cheese, this side is a WINNER! You first want to trim the ends of the woody part of the asparagus. SNAP: You can either break the ends and it will automatically break where the good juicy part begins and woody part ends. CUT: For a quicker method, stack and align all ends of asparagus together. With a knife, cut off about 3/4″-1″ of the woody part. Trim the ends of the asparagus and blanch in boiling water 4-5 minutes, until the asparagus are desired doneness. Meanwhile, saute the bacon. In the same skillet saute onion and mushrooms. Add garlic and flour and whisk until combined. In a small bowl, combine the broth, cream, hot sauce and parmesan cheese. Season with salt and pepper. Pour cream into the skillet and bring to a soft boil. Over med heat, cook until sauce thickens, about 3-4 minutes (stir frequently so the sauce doesn’t burn). Add asparagus back into the skillet, and mix to combine. Top dish with cheese and close lid. Cook over med/low heat until cheese completely melts. Though I love this asparagus recipe so much, there are other many options on how to cook asparagus and most of them extremely easy. BAKED– Drizzle asparagus with oil or butter and season with your favorite seasonings. Bake (roast) in the oven at 425°F for 12-15 minutes, or until desired tenderness is reached. GRILLED– Just like baked asparagus, grilling asparagus is so quick. Drizzle asparagus with oil and season. Grill over medium heat 3-5 minutes turning as needed. BLANCH– To blanch asparagus, bring water to a boil. Add the asparagus and cook 3-5 minutes, depending on the thickness of the asparagus and desired doneness. SAUTE– Coat asparagus with oil and season to taste, saute 7-8 minutes over medium heat. You’re going to fall in love with this one-pan asparagus dish. 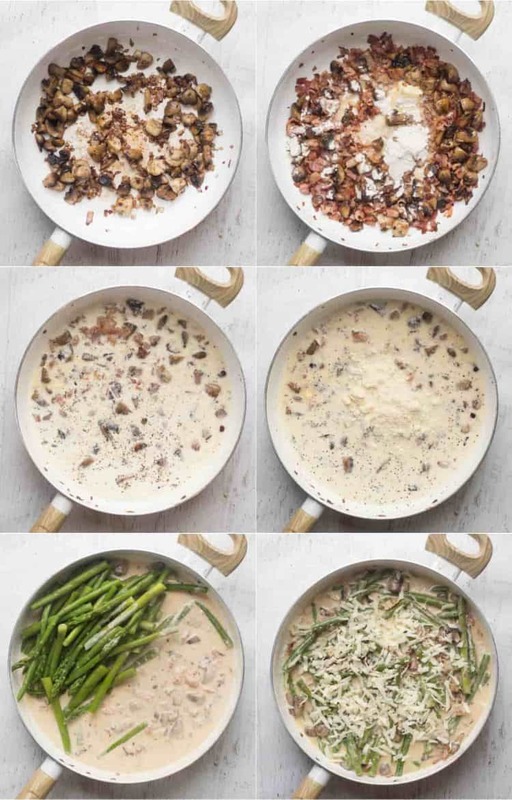 I cannot begin to explain the amazing flavors of the Alfredo sauce with bacon and mushroom with asparagus. Truly DELICIOUS and so easy! Mushroom Bacon Brussel Sprouts– classic combination. Baked French Fries– so much better than frying. Green Bean Casserole Recipe– the homemade onions strings are a winner. Quick Asparagus Recipe ready in 30 minutes, a one-pan stovetop dish. 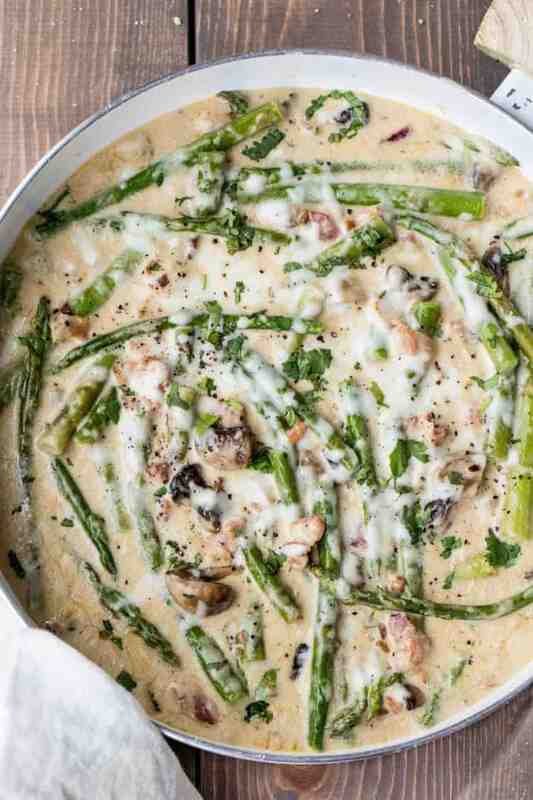 Tender asparagus cooked in the most amazing cheesy parmesan alfredo sauce loaded with bacon and mushrooms. Trim the ends of the asparagus. Blanch in boiling water for 4-6 minutes, or until desired tenderness is reached. Drain asparagus, cover and set aside. Cut bacon into bite-sized pieces and cook sautee until fully cooked. Remove from skillet. Finely chop onions and slice mushrooms. In the same skillet, over med heat, cook onions and mushrooms in the bacon grease and butter until onions are tender. Once mushrooms are cooked, add bacon back and minced garlic. Saute for a minute. In a small bowl, combine the chicken broth, heavy whipping cream, hot sauce, parmesan cheese and season with salt and pepper. Pour into skillet. Bring sauce to a soft boil, simmer 3-4 minutes or until sauce begins to thicken. 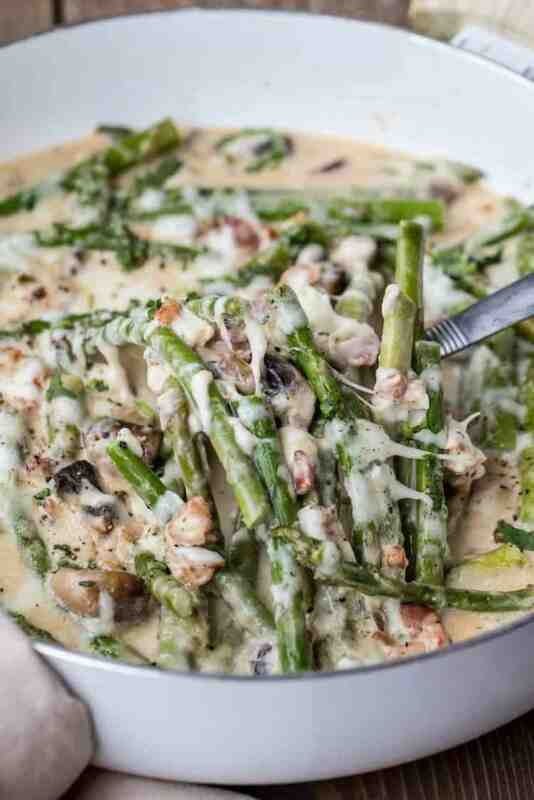 Add the cooked asparagus to sauce and mix into the creamy sauce. Sprinkle cheese, close lid on skillet and turn heat down to a med/low. Cook until cheese melts. Garnish with herbs and fresh ground pepper, if desired. BEST ASPARAGUS EVER!!!!!! My family loves this recipe, I make it all the time now! That’s wonderful, Jennifer. I’m so happy to hear that. This was really amazing! I love how creamy it is!! I love all of this creamy deliciousness! Great recipe! Wow this looks super delicious! I can’t wait to try it out! I hope you enjoy this Asparagus recipe! This is on our menu for this week! Aimee, I hope you love this creamy Asparagus Recipe.